The President of SOCAR, the State Oil Company of Azerbaijan, is touring the United States at the moment. His goal is, in part, to gain support for the Baku Higher Petroleum School, a place to generate the indigenous engineers that his firm needs for future resource development(about 75% of the labor force is currently Azeri, but at lower levels of management). The school is expected to open its doors next September. While this is perhaps a little late to the game, it underscores the global need to find those individuals who can be technically trained and who are then willing to spend weeks of their lives in increasingly remote parts of the world, often in inclement conditions, just so that the rest of us can have an easy commute to work in the mornings. (Folks were even talking about the opportunities in the wilds of North Dakota at our Rotary meeting this week). The effort by SOCAR also underscores the point that there remains a future for the petroleum industry in Azerbaijan despite the long history of oil recovery the nation has already seen with the depletion of many old reservoirs. There are new fields in which oil and natural gas are being developed, though as Darwinian pointed out, the rapid build-up in production to which I referred last time has more recently begun tailing off. He referred to the Joint Organizations Data Initiative – Oil (JODI), which shows the decline from 1.05 mbd in July 2010 to 920 kbd this September. That peak was down from the peak of almost 1.1 mbd in early 2008. This year the decline has reached around 11% pa and while SOCAR explains that this is the result of introducing additional safety measures following the Deepwater Horizon event and for scheduled maintenance, the number seems a little large for such a cause. 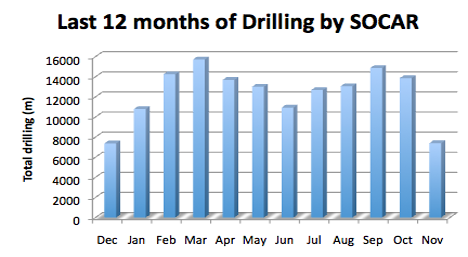 Further, if one looks at the drilling record for the country, SOCAR reports that while drilling was down last month (and likely will also be this month), overall they anticipate exceeding the 2010 figures, with roughly 90% of the work going for development and about 10% for exploration. The development drilling is down from the 2010 figure, which was lower than that in 2009, which was below the level of 2008. But some of this may have been market driven as one can certainly see in the natural gas numbers that I discuss below. 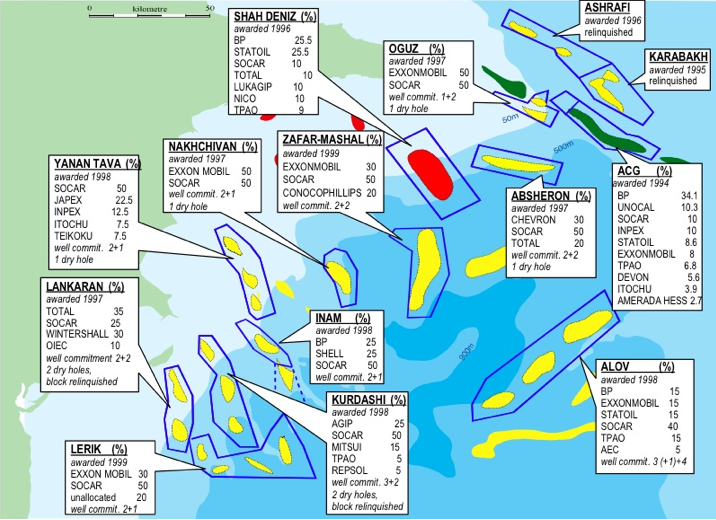 During the first three quarters of 2011, ACG produced on average 757,500 barrels per day (b/d) (206.8 million barrels or 27.9 million tonnes in total) from the Chirag, Central Azeri, West Azeri, East Azeri and Deepwater Gunashli platforms. Chirag had 12 wells (8 oil producers and 4 water injectors), producing on average of 73,300 b/d. Central Azeri (CA) had 19 wells (13 oil producers, 5 gas injectors and one water injector), producing on average 209,200 b/d. West Azeri (WA) had 19 wells (13 oil producers and 6 water injectors), producing on average 213,800 b/d. East Azeri (EA) had 14 wells (11 oil producers and 3 water injectors), producing on average 134,300 b/d. Deep Water Gunashli (DWG) had 21 wells (12 oil producers and 9 water injectors), producing on average 126,900 b/d of oil. A new platform is in construction for Chirag, aimed at adding 185 kbd to current production in 2013, which with increased drilling at the other platforms (averaging about 20 wells a year) may, in the short term, bring the production back toward the 1 mbd target production. The total estimated recoverable reserve is estimated at 5.4 billion barrels of oil, of which around 1.8 billion is estimated to have been produced to date. The partnership is currently extended until 2024. The natural gas picture is a little more complicated. Although the ACG complex produces more gas than Shah Deniz, roughly 75% of it is re-injected to maintain reservoir pressure. Discounting the production from Shah Deniz, SOCAR is still producing natural gas for export to Europe, for which it is still being paid on average $191 per 1,000 cu m (kcm) ($5.40 per 1,000 cu.ft or million Btu approx) this year, though down to $151 in October. These prices are significantly higher than the $61 per kcm it received last year, and are also ahead of the $186 price in 2009, though just under the 2008 average. They are undercutting the price of Russian gas, which they report as being some $446 per kcm this year, though it is anticipated to fall to $415 next year. In perspective, Ukraine is currently paying $400 per kcm, ($11.33 per kcf) for Russian gas, but hoping to get that price lowered. SOCAR is anticipating that this market may dry up in three years when the gas fields off Cyprus are brought into production. This will be gas from the Aphrodite gas field, which holds some 3.3 Tcm of natural gas – about three times the reserves for Shah Deniz. That area of the Mediterranean is, however, quite politically sensitive. 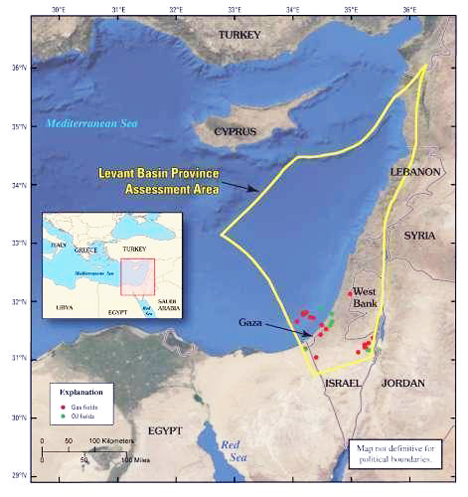 Together with other fields (Leviathan and Tamar), this area of the Mediterranean is estimated to have 10 trillion cu m of gas. In connection with the worsening political and military situation, fields Leviathan, Tamar and Block 12 have been patrolled by Israeli drones. Russia sends its only aircraft carrier to this area, while fleets of other countries claiming to develop these fields are drawing as well. These new fields lie in the Levant Basin Province, and given this location and the neighborhood, who will end up producing what is going to be an interesting development to watch. Given the size of the deposits, their development could also change the economics of natural gas distribution for some time. SOCAR is hoping that as this transpires, it may get additional supplies from Turkmenistan through a trans-Caspian pipeline that could be completed by 2015. Concurrently, Shah Deniz II, slated to produce some 100 kbd of oil and 16 bcm of natural gas, is being prepared for production to start in 2017. In the short term, production of oil from Azerbaijan will continue at roughly current levels but the volumes of gas that will be available on the global market may exceed demand within the near future, unless as now, they significantly discount the price. This is a good move by the President of SOCAR. This move will gain the neccessary supprt from the Baku Higher Petroleum School. This school has been producing good engineers for the Oil industry.